I've decided that I'm going to be a bit weird and go back and review all my old Birchboxes that I didn't get around to reviewing the first time around because things got so hectic last year with the release of my movie and everything. I figure most of these products are still available and it's still good info for people to have when making shopping decisions. First up: October of 2013! I told you they were old. But the bonus is I have lot more experience with some of these products to review them. 12 Benefits Instant Healthy Hair Treatment: I did like this product, and the smell was quite nice. But it wasn't anything really amazing and I didn't end up wanting to buy a full size of it because I still love the awesome Number 4 Super Comb and Protect from my first Birchbox. theBalm cosmetics Stainiac: I only just finished up using this sample recently because a little goes a long way. I only generally used it as a lip stain, because I don't need that much color added to my cheeks most days since my face is already rather pink in general. This was a really great stain, and it added a fantastic subtle bit of color to my lips. You couldn't exactly tell I was wearing anything unless I put it on unevenly or something. Which I liked, I think it looked great without looking too much like a "product." Now, it did take getting used to, it takes quite a while to feel dry, and that could be a turn off for some people. That's because of how it works as a stain, you need to be able to blend it for a bit after putting it on. So I was fine with that, but I could see how other people might want a more traditional product. Liz Earle Cleanse & Polish Hot Cloth Cleanser and Muslin Cloth: I really love this cleanser, it's probably the best one I've gotten in the last year between Birchbox and trying samples from Origins and other brands. The muslin cloth is awesome (though a bit overpriced, I admit, I'd only go for it in the package deal). My sister got me a full size version of this for my birthday last year, because she loves it too and I even picked another travel size for my sample choice a few months ago because I wanted one that was easier to travel with and was a TSA approved size. Definitely a good find. Chapstick Hydration Lock: As far as I can tell this product has been discontinued by Chapstick for their new Dual-Ended versions. Which is fine as long as at least one of those ends is the same as this original formula. I thought it was so silly when I got this sample, I admit it. I buy cheap chapstick because I lose them so much or end up putting them through the washer because I left them in my pockets. I have a ton of chapstick, I use it a lot, but I just don't see the point in more expensive ones. Or at least I didn't, until this product ended up in my Birchbox. Seriously when this stuff says it lasts for eight hours, it means it. It's worth the price because it'll last longer since you don't have to reapply so often. It feels nice, it works, and it is seriously the best chapstick type product I've ever used. It's also a fantastic base for lipstick because then you don't end up with dry, icky feeling lips later in the day that you can't do much about without messing up your makeup. Huge win on this one. So that was my fantastic October of 2013 box. I actually did review November of 2013, so next up will be December! 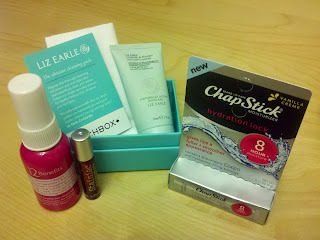 And I've had my Birchbox subscription for a year and a half now, and I can absolutely say it's worth every penny. The boxes are great, I love the surprise every month. They've added their monthly sample choice and Birchbox Plus program recently and those are both fantastic, then on top of their already best in the business loyalty points system, they've started up Birchbox Aces which is an even better perk. I've only dealt with their customer service very rarely, but when I have they've been absolutely stellar. It is absolutely worth the price, and I recommend them highly. If you want to give them a try, please consider using my referral link! Thanks!